This year’s 20 JATCSF scholarship recipients pose for a group photo at the Quiet Cannon in Montebello with JATCSF Chairperson and President Kitty Sankey (front row, center). The JATCSF was established in 1960 by the Japanese Chamber of Commerce of Southern California to mark the centennial of the arrival of the first official Japanese delegation to the U.S. in 1860. Established with $100,000, the fund has awarded more than 1,700 scholarships. Fourth-grader Chihiro Kato led the Pledge of Allegiance. The luncheon began with Chihiro Kato, a fourth-grader at Joaquin Miller Elementary School in Burbank, leading the Pledge of Allegiance. Invocation was given by Howard Miyoshi of Zenshuji Soto Mission. She added that this year marks the first time that three past recipients have played a key role in the event: Molly Serizawa (2009), who served as emcee, and Katharina Miyoshi (2013) and Elise Takehama (2015), who introduced this year’s awardees. Serizawa also organized a workshop for the recipients that covered such topics as etiquette and networking. Miyoshi, who is studying nursing sciences at UC Irvine, said that she and Takehama, who is studying journalism at Boston University, are available if the new recipients have any questions about college. Past recipients Elise Takehama and Katharina Miyoshi introduced this year’s recipients. • Alyssa Hirakata Chang, a graduate of Sherman Oaks Center for Enriched Studies in Tarzana. She was founder and president of Peer 2 Peer Math Tutoring Club, a clarinetist with SOCES’ award-winning Wind Ensemble, an AP Scholar with Honors, and team captain and starting singles on the varsity girls’ tennis team. She will attend UC Berkeley, majoring in pre-med and philosophy. She hopes to cure and care for those with cancer. • Sheldon Satoru Ruhue Chen, a graduate of South Pasadena High School in South Pasadena. He was on the Math Team and Junior Varsity Cross-Country Team and was a four-year member of the school band, receiving an award as outstanding band member. He was a standby translator at Touhoku University Hospital in Sendai and volunteered at the Japanese Chamber of Commerce Oshogatsu Festival. He will attend UC Berkeley with a major in engineering and hopes to pursue a career as a programmer. 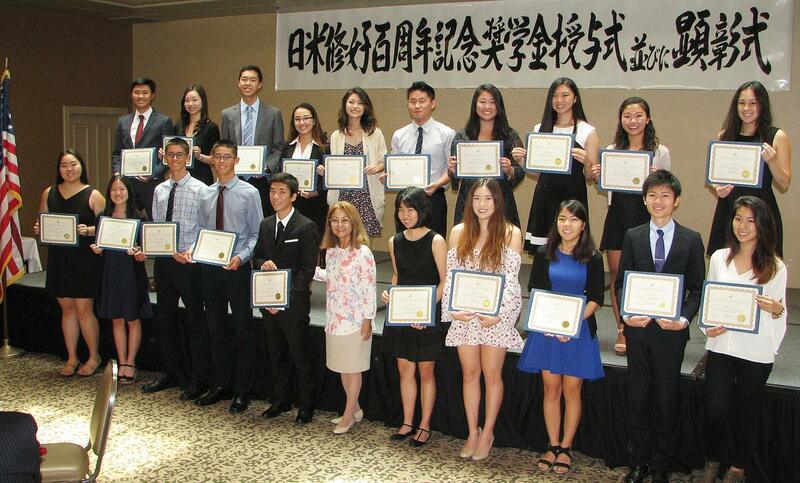 Cheng and Chen received scholarships from the Kenji Ito Memorial Fund, presented by Ayleen Ito-Lee. • Jacquelyn Minako Giese, a graduate of Del Norte High School in San Diego. She was a tutor and supervisor for the Writing Help and Tutoring Center and also worked as a tutor for elementary students at the 4S Ranch Library. She has trained as a dancer since she was 5 and has been part of the Dance Unlimited Performing Arts Academy Competition Team, winning awards and recognition for her solos. She will attend Harvey Mudd College in Claremont, majoring in engineering or computer science, with an eye on a career as a patent attorney or software engineer. • Gregory Takashi Gladkov, a graduate of Palisades Charter High School in Pacific Palisades. He served as vice president of the Envirothon Club and won first place in the 2015 and 2016 California State Envirothon competition. He was in charge of native plant propagation through the Bowdoin Street Median Project. He participated and placed in the Tanabata Festival and ranked 1st dan in Shotokan karate. He will major in molecular and environmental biology at UC Berkeley and plans to become a private consultant who facilitates ecosystem restoration or a restoration ecologist for a government agency in California. Giese and Gladkov received a scholarship from the Aratani Foundation, presented by Tatsushi Nakamura. • Maya Hanaoka, a graduate of Tesoro High School in Las Flores. She was an AP Scholar with Distinction, a National Merit Commended Student, and a junior varsity and varsity cheerleader. She played piano for 10 years, was a Lion’s Heart teen volunteer, and attended school in Japan during the summer for six years. She will attend UC Berkeley with an undeclared major and wants to be a researcher in medicine. Hanaoka received a scholarship from Mr. and Mrs. Ward Nishida, presented by Susie Takemoto. • Hannah Harasaki, a graduate of North High School in Torrance. She served in the California Scholarship Federation and Student Council/ASB, was vice president of the Saxon Buddies, and won a Triliteracy Award for Korean and Japanese. She participated in the Relay for Life and Friends without Barriers. She will attend UC Santa Barbara, majoring in global studies, then become involved in international business. 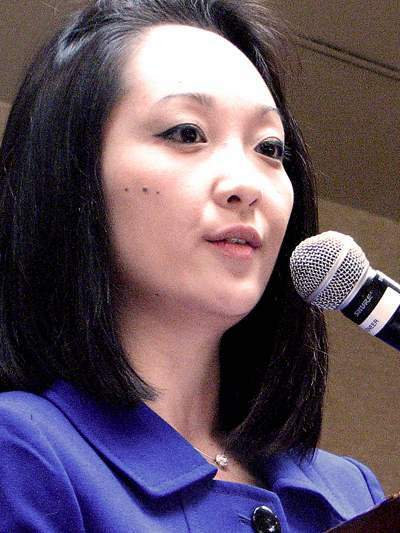 • Emily Michiko Kimura, a graduate of Carlsbad High School in Carlsbad. She served with the Speech and Debate Team and the Varsity Academic League, and was a Royal Lancer. She was concertmaster of San Diego Civic Youth Orchestra and studied at the Colburn School of Music. She will attend Barnard College of Columbia University in New York with an undeclared major and seeks a career in mathematics or as a museum curator. Harasaki and Kimura received scholarships from the Yoshimoto Scholarship Fund, presented by Naomi Yoshimoto. • Megumi Kishimoto, a graduate of Huntington Beach High School in Huntington Beach. She was a member of the California Scholarship Federation and National Honor Society, played junior varsity and varsity tennis, and earned the AP Scholar Award. She studied karate for 12 years and was a karate instructor. She plans to major in biological sciences at UC Irvine and would like to become an optometrist or pursue a career relating to the sciences. • Kayla Mino Kotake, a graduate of Adolfo Camarillo High School in Camarillo. She was a member of the California Scholarship Federation, Girls Up, and Medical Interest Group, and was a Distinguished Student. She played junior varsity and varsity golf as well as junior varsity and varsity basketball. She will attend San Diego State University, majoring in kinesiology with an emphasis in pre-physical therapy. When her baachan had a stroke, the therapist was able to help her regain her independence, thus inspiring Kotake to seek a career as a physical therapist. Kishimoto and Kotake received scholarships from the Nerio Memorial Fund, presented by Betty Hisako Imamura. 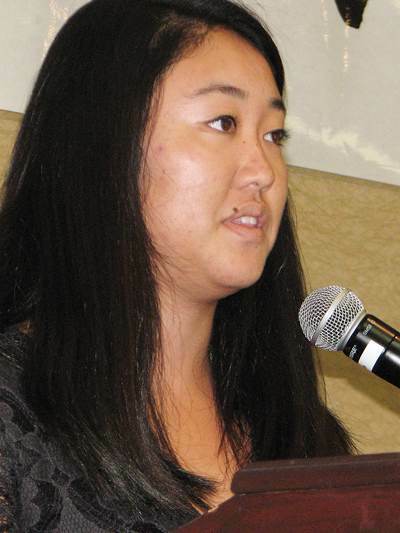 Lindsay Masukawa spoke on behalf of this year’s recipients. • Lindsay Mie Masukawa, a graduate of Cypress High School in Cypress. She was a member of the Associated Student Body and California Association of Directors of Activities, and was on the junior varsity and varsity basketball teams. She won the Bronze, Silver, and Gold Awards through Girl Scouts and participated in the UC Irvine summer pre-med program. She will major in biology at UCLA. The combination of medical experiences and love for helping others has inspired her to pursue a career in medicine. Masukawa received a scholarship from the Kiyoshi Takemoto Memorial Fund, presented by Susie Takemoto. • Adam Hidetaka Mayeda, a graduate of El Segundo High School in El Segundo. He participated in the Robotics Club, the varsity surf team, and junior varsity and varsity volleyball. He achieved the rank of Eagle Scout, played with the California Volleyball Association, and is a black belt in Shotokan karate. He will attend UC Santa Cruz, majoring in computer science. Since he has been enrolled in the engineering pathway at his school, he wants a career in the engineering field. • Noah Haruka Mayeda, a graduate of El Segundo High School. He participated in the Robotics Club, junior varsity and varsity volleyball, and varsity surf team. He was a member of Devil Pups (a non-profit group), obtained the rank of Eagle Scout, and is a black belt in Shotokan karate. He will attend the California State University Maritime Academy, majoring in mechanical engineering. He plans to attend the Naval Academy to become an officer in the Navy. The Mayeda brothers, who are twins, received scholarships from the Nerio Memorial Fund, presented by Art Masao Nerio. • Alexander Nakagawa, a graduate of South Pasadena High School in Pasadena. He was associate sports editor of the school’s Tiger newspaper and president of the Autism Club, and played both varsity basketball and volleyball. He was an Eagle Scout and played with the Yonsei Basketball Association in his spare time. He will major in computer science at UC Berkeley and hopes to make a positive impact on society by working in information science. Nakagawa received a scholarship from Mr. and Mrs. Noritoshi Kanai, presented by Mr. Kanai. • Ryota Nishishiba, a graduate of West High School in Torrance. He was a marching band drum major, first tenor saxophone for both the Wind Ensemble and Jazz Band, and a UNICEF club founder and board member. He worked with the Torrance Youth Council and chaired the Shared Bread Soup Kitchen. He will attend Washington University in St. Louis, majoring in biology, and would like to become a neurosurgeon and fulfill his passion for physiology/anatomy while saving people’s lives. Nishishiba received a scholarship from the Hiroshi Miyazono Memorial Fund, presented by Susie Takemoto. • Kana Okafuji, a graduate of Canyon High School in Anaheim. She was a production designer and the yearbook’s augmented reality section director, and was in the advanced filmmaking class in association with the FilmEd Academy of the Arts. She took piano for seven years and has also been a competitive figure skater for ten years. She will major in bioengineering at UC San Diego. As a bioengineer, she hopes to advance medicine by designing new equipment and developing technology. Okafuji received a scholarship from Mr. and Mrs. Jack Naito, presented by Mr. Naito. • Kyle Masashi Okazaki, a graduate of La Cañada High School in La Cañada. He was UNICEF Club secretary, Boys’ State secretary of business and transportation, and a member of the Healing Hands for Haiti Club. He played Tiger’s Youth Club basketball and was on the cabinet for the Junior YBA Southern District Boys Athletics. He will attend UCLA and major in chemical engineering. As a chemical engineer, he wishes to create a more sustainable future with the environment in mind. Okazaki received a scholarship from Mr. and Mrs. Toshio Handa, presented by Mr. and Mrs. Handa. • Yuko Shimura, a graduate of Canyon High School in Anaheim. She was president of the Japanese Club and of Benefits for Pets, event coordinator of the Live Poets Society, and Ambassador Captain of her school. She volunteered with Orange County Japanese American Association and with Canyon Hills Library, and competes with a hip-hop dance team, Team Millennia Juniors. She will major in International Studies at UC Irvine and plans to work in business/hotel management in Japan. Shimura received her scholarship from Mr. and Mrs. Shoichi Sayano, presented by Mr. Sayano. • Natasha Takahashi, a graduate of Woodbridge High School in Irvine. She was chapter founder and president of the Future Business Leaders of America, co-president and founder of Amigos Juntos Minority Awareness, and a member of the Varsity Dance Team. She was a counselor with Kids Konnected and a Spanish translator and medical assistant at the Santa Ana Food Pantry. She is part of USC’s World Bachelor in Business program and plans to found several corporations to solve worldwide issues and to begin a professional mentorship program for young girls. Takahashi received a scholarship from Mr. and Mrs. Haru Takehana, presented by Mr. Takehana. • Kristine Yada, a graduate of Arnold O. Beckman High School in Irvine. She was a student volunteer coordinator with the Red Cross Club, a Beckman autism youth ambassador, upper classman representative, and a member of girls’ junior varsity and varsity basketball. She received the Bronze, Silver, and Gold Awards in Girl Scouts and played SEYO basketball. She will attend University of San Francisco, where she will major in accounting, and plans to seek a job in the financial sector. Past recipient Molly Serizawa served as emcee. • Reiko Yoshizawa, a graduate of West High School in Torrance. She was vice president/treasurer of Interact, held lead and supporting roles in play productions, and was on the junior varsity and varsity tennis teams. She was an intern with a youth development program in Torrance and a Relay for Life team captain. She will major in mechanical engineering at UC Davis and would like to work for a large aerospace company and collaborate with other engineers to design, build, and improve aircrafts. 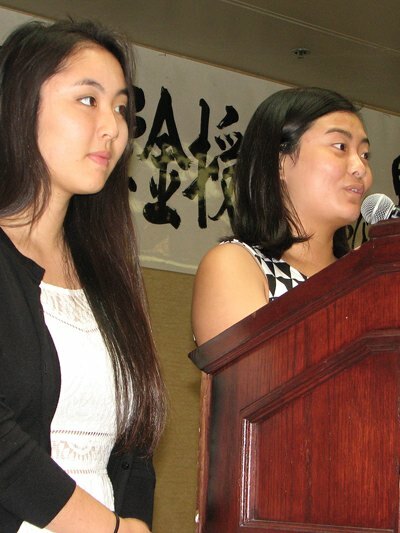 Yada and Yoshizawa received scholarships from the Yoshimoto Scholarship Fund, presented by Naomi Yoshimoto. Masukawa, a Yonsei Basketball alum whose father was a scholarship recipient in 1983, gave thanks on behalf of this year’s recipients. “This was the first year that JCCSC has held a workshop for scholarship recipients, giving us the opportunity to better understand the tradition and history behind the scholarship and enabling us to further develop our leadership skills that we will carry with us in all our future endeavors.